PET TAIL #2: Jersey’s Story! t the person did not stop to help my Dad who was alone, with a dog who could not walk, vomiting blood, and weighed 120 pounds. Our poor little girl ended up with 2 broken legs and had to live in splints for EIGHT weeks! 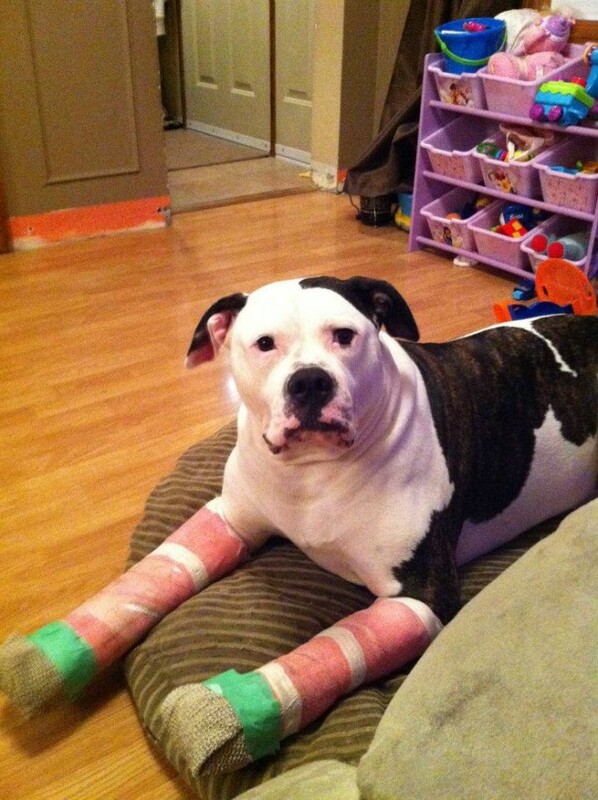 She developed pressure ulcers in both legs from the splints, and had to undergo emergency surgery to her right paw to salvage what they could. She lost her “pinky” digit as well as her “thumb” and had to heal without the help of the splints. It was extremely hard to watch her go through everything she did; and much to our amazement, she is doing fantastic today! Her front legs bow inwards and are not straight up and down like they were, but she has learned to adapt and does not let this slow her down! Hope her story is an inspiration! It takes a very special person to do the job you guys do! Hello. I believe there is an issue with your loading speed. I hope you can fix it! Thank you, we have not had any issues posted like this previously, but we will look into it.